It is clear that enhanced greenhouse warming is a failed prediction and the true climate response is in the vicinity of 1 degree per doubling. This issue is no longer about science, but is now 100% political. Obviously you did read the article about the climate sensitivity study at all. Doubling the CO2 in in the atmosphere will rise that 1°C is physics, professor Cox's study science. BTW the study shows that the “equilibrium climate sensitivity” (ECS) is 2.8°C, not so far from the IPCC estimate 3°C. The politics comes from denier side. I read quite a bit more than the article (including the paper itself). You, on the other hand, clearly have not read any of the Assessment Reports since you clearly don't actually know what the IPCC's estimated response actually is. Actual warming since 1979 per satellite records (UAH and RSS) has been ~0.4 degrees (as of December 2017), some of which is natural and cyclical (70's were the coming Ice Age after all), and little of which has been in the 21st century (you know, that time frame where the bulk of the CO2 increase has been?). Given the logarithmic relation on CO2 forcing with the increase from pre-industrial 280ppm to current 400ppm, we should be in the vicinity of half of the expected heating from the doubling of 280ppm to 560ppm. That is to say it looks like real world response is somewhere in the vicinity of 1 degree per doubling depending on how much natural warming you think happened and how long you think the response time might be. If you truly believe in 3 degrees per doubling, the question is...where is it? Hiding in the deep oceans along with Trenberth's credibility? The meteroric rise of human dominance of Earth has CLEARLY impacted natural ecologies and may be exerted influence(s) on climatic processes. CO^2 might even be one of the contributors. But it is basic science that CO^2 is one of the WEAKEST green house gases, and that combined with its minuscule concentrations (even at its geological maxima during the Mesozoic) all suggest at a glance that any model of acute, rapid anthropogenic climate change that hinged totally and completely on CO^2 pollution was always a weak contender. This is on top of the fact that CO^2 is consumed by photoautotrophs and as such, MORE CO^2 output may actually PROMOTE ecological health by promoting plant growth; a reasonable starting hypothesis at least, a detailed and careful analysis might reveal a much more complicated story. Being interested in anthropogenic impacts on natural ecology and Earth systems more broadly is wonderful. I applaud it. But most "climate change" protagonists belie ANY real interest by virtue of drumming an overly-simplified, empirically-suspect, and causally-questionable model with limited (and even specious) empirical support and which also shows a profoundly clear political/economic agenda: carbon tax. According to NASA Global Greening has been about 30% and of this, 70% is due to increased levels of CO2 in the atmosphere. Therefore CO2 has directly lead to about a 20% greening worldwide...note that this includes food crops. A 20% increase in cropland productivity for free is a pretty damn big boon. Yes, latest IPCC SR5 report does not give any single number for estimated ECS. As estimated by the IPCC Fifth Assessment Report (AR5) "there is high confidence that ECS is extremely unlikely less than 1°C and medium confidence that the ECS is likely between 1.5°C and 4.5°C and very unlikely greater than 6°C." This is a change from the IPCC Fourth Assessment Report (AR4), which said it was likely to be in the range 2 to 4.5 °C with a best estimate of about 3 °C, and is very unlikely to be less than 1.5 °C. Values substantially higher than 4.5 °C cannot be excluded, but agreement of models with observations is not as good for those values. The IPCC Third Assessment Report (TAR) said it was "likely to be in the range of 1.5 to 4.5 °C". Other estimates of climate sensitivity are discussed later on. This Cox study gives more narrow range (2.2-3.4), with with a best estimate of 2.8 C.
As for the satellite data, what you write contradicts the RSS data. Finally with ECS of 2.8 and the CO2 rise from 280 to 405 ppm should give temperature rise log2(405 / 280) * 2.8K = 1.49K. 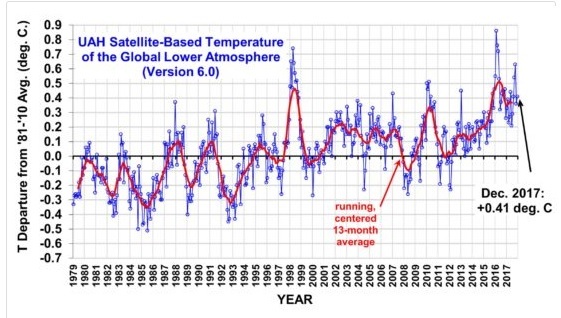 In the real the warming seems to be little less than 1.49K, something like 1.2K or less if I am not completely blind. So some 0.3K warming is missing. There is actually a very simple reason for the difference. The ECS is a step response for doubling the CO2. 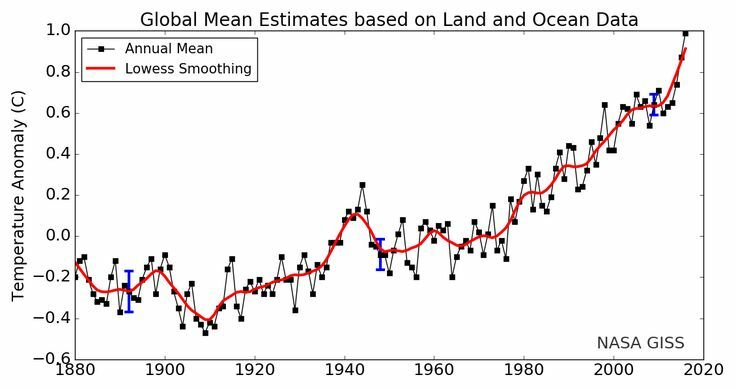 But on the real worl the CO2 is increasing gradually, not with sudden doubling. The real climate is a ramp response to the increasing CO2. So Mr. Trenberth has no credibility problems, just on the contrary. I hope all this is not too advanced for your tiny brain. Did you actually look at the RSS graph you posted? Also, dude...if you think "It's hiding at the bottom of the ocean" Trenberth has any credibility whatsoever I am not sure we can have any sort of productive discussion...Actually I am not really sure why I am bothering trying to have a conversation with you at all, to be honest. Your history here indicates that this is a waste of time. For anyone else who is interested, here is a discussion about the Article Nero is speaking about. https://wattsupwiththat.com/2018/01/22/ ... d-to-2-8c/ Read the referenced paper if you can, it is worth the read if you follow this issue at all. That article has been mysteriously scrubbed from the link. I did a google search for the title. It shows up as the first link, but same thing. Green cultists have it removed? I was misreading your "~" as - and hence thinking that you are suggesting that satellite shows cooling. That's why I presented the RSS graph. And we agree that it shows ~0.7K warming. Using the trend 0.191 K / decade and time from 1979 we get 3.8 * 0.191K = 0.73K. Looks very much similar to the RSS graph. But this 0.41 number for December 2017 is not warming since 1979, but deviation from '81-'10 average. I am pretty certain that calculating the trend from the UAH data gives the same value as the RSS data gives (same data from the same satellites). 3rd I assume that your number 1.5 refers to the result of my calculation log2(405 / 280) * 2.8K = 1.49K. This represents theoretical warming caused by increasing CO2 from 280ppm to 405ppm and hence the time scale is from 1800 to present day. I was not claiming that temperature is up from 1979 1.5K. Just for fun I repeat the calcation from year 1979. But what is needed is the CO2 concentration in the year 1979. Digging the values from NOAA data we have 336.84(1979) and 406.53(2017). So log2(406.53 / 336.84) * 2.8K = 0.76K agrees quite nicely with 0.73K caluculated from the RSS trend. Actually this makes me believe that Cox's ECS value of 2.8K is slightly too low given system inertia I covered in my previous post. 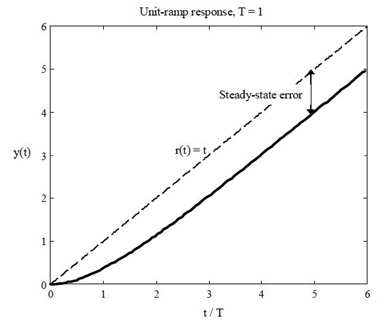 And I am not alone with this: The claim of reduced uncertainty for equilibrium climate sensitivity is premature. PS. I expect Doggie to intervene with his infinite wisdom and prove that CO2 is just a trace gas that has no effect on climate. So we have found that if you start from the coldest point since 1950 (important year because this is accepted as the year where atmospheric CO2 started increasing) and measure to present you max out at ~3.0 per doubling assuming all the warming is attributable to CO2 with no natural warming involved. Now run that same calculation from 1950 to present. In 1950 the temperature anomaly was +0.4 degrees per HADCRUT (which is a highly questionable series due to data tampering / adjusting, but whatever). You'll find that if you plug in +0.4 or +0.5 as the current anomaly at 405ppm and start at +0.4 in 1950 at 280ppm your result changes quite a bit, no? Once you've done that try plugging in 1950 through 1979...you go from +0.4 degrees to -0.2 degrees (0.6 degrees of cooling) while CO2 *increases*. What is the climate response there? Some magical unknown forcing that comes and goes in just sufficient amounts to push temperature down from 1950 to 1980, let it rise 1980 through 2000 and then come back and hold temperatures constant 2000 - present all overlaid on a steady background forcing of ~3.0 degrees per doubling of CO2? Or is it cleaner to assume that maybe there is no magical on again / off again forcing and that the feedbacks from mild warming are negative or neutral instead of positive? After all lab measured CO2 forcing is 1.1 degrees per doubling and assuming any sort of enhanced effect beyond that is not only hard to see in the actual data, but would logically result in an unstable climate system...something that is hard to see in the geologic record, right? You're a smart guy...stop and think for a minute instead of just regurgitating the propaganda and hoping that cherry picking certain data while ignoring others is going to be some sort of "gotcha" moment in a meaningless internet argument. Oh, and before you Google for the propaganda argument against this very line of reasoning, no, I don't find the "Aerosals!" argument to be particularly persuasive either. You've been doing some serious diving on this. Remind me to +rep your legwork. A: None of the predictions ever actually happen. B: The people pushing the doom never actually act or talk like scientists. They sound like priests. C: The data is CONSTANTLY manipulated in the most blatant of ways. Ongoing and multiple adjustments to 50 year old data, cherry picking of dates and statistics, goalpost shifting. If the data is clear and the results are catastrophic, why the need to do all this shady crap? D: All the people pushing the theory seem to have ulterior political / economic motives. My conclusions are that cAGW (Note the c in there...) is a failed theory and, while AGW is true, it is benign to beneficial at the current levels seen. Ultimately Hansen was wrong...we emitted more CO2 than he thought we would in his worst nightmare and the West Side Highway is still high and dry.